Tiffany Tu is always on her track bike and it sort of blows people’s minds. Without gears she takes on gravely, muddy paths up to the Croton Dam in Westchester, NY , steep climbs through the Palisades, and rapid descents on 9W. 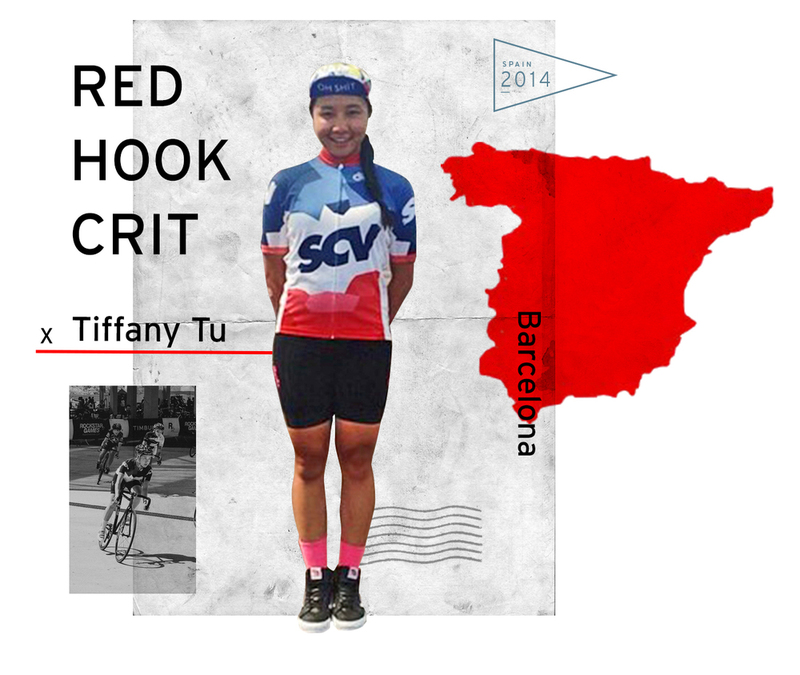 Its a different kind of cyclist that trains the way Tiffany does on a fixed gear bike, so we were not at all shocked when Tiffany announced that her very first race ever was going to be the Red Hook Crit in Barcelona. RHC is an incredibly challenging race to say the least. The field is a mix of pros and seasoned riders. It requires skill, lots of training, and a ton of courage, which is why it just might have been the perfect start for Tiffany. With the next installment of the series taking place in Milan on October 15th, we wanted to share Tiffany’s story and race images. PDF: How long have you been riding track bikes? What was it that got you into riding fixed gear bikes in the first place? TT: I have been riding fixed gear bike for almost two years. I started riding after a particularly difficult break up. It was my first real love, and afterwards I was depressed for a really long time. I knew I couldn't stay so sad, I wanted to move on with a different life. I needed something to occupy my mind. Long story short, I ended up falling in love with cycling. PDF: Was this your first race? Do you think you will continue racing? TT: It was my first formal race and I really loved it! Even though I didn't place well, I really enjoyed the cheering spectators. You think when you are out of your country, no one will know who you are. But when I was racing I heard people yelling my name and cheering me on in Spanish. I was pretty impressed! They gave me so much encouragement to keep pedaling. And yes!!! I will keep racing in the future!! PDF: Were you worried about the competition? TT: I was really nervous before the race because it was literally my first time racing! All I could think about what just trying not to crash. Those hairpin turns were a nightmare. I was afraid of turning, yet I had to maintain full speed. Before I was raced, I heard I’d be up against a strong, professional cyclist who have been racing for 11 years. I was pretty worried. But I was there to compete too, and I was definitely interested in the outcome! PDF: What did you do to train for the race? TT: My training consisted of going to Prospect Park in Brooklyn to do laps as fast as possible. That's how I trained my power to sprint. The Rapha Women’s group rides were another way for me to train for endurance. PDF: Who did you travel with? Was it your first time traveling with a bike? TT: I travel with two of the NNR crew guys, Nemo and Lalo. We didn't plan this trip until the last minute. I had thought Id be traveling with my Canadian friend, but I ended up travel with them which I dont regret at all. It was my first time traveling with my bike. I was really excited to bring the bike with me because it was a totally different experience to ride my bike in another country. PDF: What was the best part of the race? What was the worst part of the race? TT: The best part of race was definitely the excitement because I wasn’t a spectator anymore, I was one of racers! It was amazing to hear all of my friends yelling my name from different places and cheering me on! It meant so much to have Red Hook Crit Founder David Trimble cheering me on! To be honest, that gave me lots of power to keep pedaling. The worst part was probably in my own head, because I was afraid of crashing, afraid of the hairpins, I was basically afraid of everything. It was not at all about just being fast! To be smart and fearless are the most important things for racing crit like Red Hook. PDF: Did you meet other cool female racers? TT: I meet a really cool girl from Berlin, Mianzi Rei. We met because I was just trying to find find someone to join me on a group ride hosted by a local bike shop in Barcelona. We ended up on a blind girl bike date! She was super fast, incredibly kind, and really humble. On our ride she shared lots of tips for racing RHC Barcelona. PDF: What the next thing you are planning/training for? TT:The whole experience made me fall in love with racing! I will try to do more laps in Prospect Park in morning and I’ll try to make friends with winter because I need to prepare myself for the next Red Hook Crit in Brooklyn.